Workshop on Observations of Vesta and Ceres to Enhance the Scientific Return from NASA's Dawn mission. AAS-DPS meeting Fajardo, Puerto Rico. The Dawn mission will orbit both 4 Vesta and 1 Ceres to provide data that enhance our understanding of the early solar system. Scheduled to orbit Vesta from August 2011 - May 2012, the spacecraft will acquire images, visible and near-infrared spectra, gamma ray and neutron measurements and gravity field measurements. The Dawn science team is hosting this workshop to stimulate discussion and planning of observations from other observing platforms seeking enhancement to the scientific return of the mission. The workshop will include an overview of the Dawn mission and its scientific objectives, a review of our current knowledge of Vesta and observing opportunities of both Vesta and Ceres in the next three to five years. We invite observers to participate by presenting recent observational results related to Vesta and discussing opportunities and plans for upcoming observations. Location: Las Croabas A breakout room. All are invited to join in a discussion about the role of laboratory measurements in planetary science. 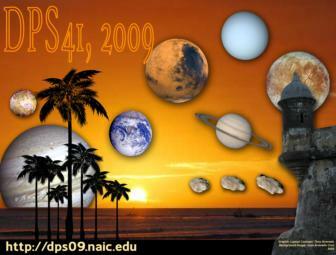 Presentations will include an introduction to the Working Group on Laboratory Astrophysics (WGLA http://members.aas.org/comms/wgla.cfm), discussion of the Laboratory Research oral and poster sessions at DPS, discussions of plans for a Laboratory Research meeting at DPS 2010, and a discussion of the visibility of laboratory research measurements and needs in the planetary science decadal survey (http://www7.nationalacademies.org/ssb/SSEdecadal2011.html). This workshop is sponsored by the WGLA and the DPS Committee. Want to learn more about providing greater access to your research? This seminar/workshop will discuss many of the details of Open Access to scientific literature, and the ways that you can provide Open Access to your own work in Icarus and other Planetary Sciences journals. Many of the journals in our field already allow some limited amount of Open Access which has been granted to you in the fine print of your copyright transfer agreements, as well as ways that you can ask publishers for more permission to share your work. We'll also talk about bills currently before congress as well as potential executive branch policies that may impose greater Open Access in our field, and ways that we, as members of a scholarly society, can ask for greater Open Access to our own work. The purpose of this workshop is to solicit ideas and information from the community in preparation for a proposal to the DPS Committee for the formation of a Professional Development committee. Such a committee might tackle topics like applying for postdocs, tenure-track jobs, how to give talks, write proposals, etc. The workshop program will include a review of online resources for professional development and a brain storming session regarding the needs of the community. All are welcome, but pre-registration is required for this event due to space limitations. Lunch will be provided. Following its July 2015 Pluto encounter, the New Horizons (NH) spacecraft will continue into the Kuiper Belt, and it is hoped that one or more KBOs can be targeted for close flybys. Statistically, it is likely that there are KBOs brighter than magnitude 27 that are accessible by the spacecraft, but these bodies have yet to be discovered. The optimum time for a search for flyby targets for NH is the period 2011-2014, when the search area is relatively small and is beginning to emerge from the Milky Way. Large-aperture telescopes, wide-field imagers, and software capable of extracting moving objects from crowded starfields will be required. The New Horizons project is soliciting help from the astronomical community for this search, and can provide financial support for selected search teams. NH science team participation of search team PIs in the KBO encounter(s) is also a possibility. The workshop will include discussion of the search region, search depth required, possible search and data analysis strategies, results of preliminary searches, and potential mechanisms for forming and funding search teams.